Palm Desert is home to spectacular Views & Hikes! Montecito in Palm Desert is a smaller gated community, of semi-custom homes on sprawling lots ideally located to many desert amenities. These exclusive residences boast an abundance of architectural detail and craftsmanship and most have sparkling pools and spas of their own. Montecito is adjacent to the renowned Desert Willow Golf Course, with its two courses. Residents at Montecito, enjoy a special rate of $45 to play there. Nearby you can find schools, shopping, restaurants, Eisenhower Medical Center and the I-10 freeway is 5 minutes away. The homes in Montecito offer the finest of the Desert Lifestyle in your own quiet and private oasis. The HOAs are low, so why pay more when you are so convenient to everything in the desert?? The beautiful homes in Montecito were built from ’92 to ’06 and typically feature 3 to 4 bedroom homes from approx. 2,900 sf to nearly 4,000 sf. Recent HOA’s are $160/mo. These homes appeal to year round residents, vacation home owners and families too! Montecito is a gated, non-golf course Community offering affordable homes in a great location. 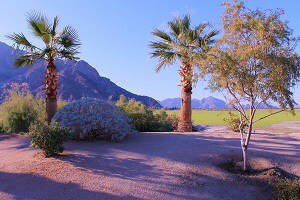 Palm Desert is our Desert City that is central to so many terrific amenities. Catch Theater or a musical event at the gorgeous McCallum, learn to play Golf at College of the Desert, or catch a movie at Palm D’Or at the Mall.